An unaltered photocopy of your DD-214, WD AGO, NAVPERS, NG or other military issued document clearly displaying your award of the Legion Of Merit. a. The Legion of Merit, section 1121, title 10, United States Code (10 USC 1121), was established by Act of Congress 20 July 1942.
b. The Legion of Merit is awarded to any member of the Armed Forces of the United States or a friendly foreign nation who has distinguished himself or herself by exceptionally meritorious conduct in the performance of outstanding services and achievements. (1) The performance must have been such as to merit recognition of key individuals for service rendered in a clearly exceptional manner. Performance of duties normal to the grade, branch, specialty, or assignment, and experience of an individual is not an adequate basis for this award. (2) For service not related to actual war, the term "key individuals" applies to a narrower range of positions than in time of war and requires evidence of significant achievement. In peacetime, service should be in the nature of a special requirement or of an extremely difficult duty performed in an unprecedented and clearly exceptional manner. However, justification of the award may accrue by virtue of exceptionally meritorious service in a succession of important positions. (3) Award will be made without reference to degree. d. Criteria for member of Armed Forces of foreign nations is in AR 672-7(C). The President, under regulations to be prescribed by him, may award a decoration called the ''Legion of Merit'', having suitable appurtenances and devices and not more than four degrees, to any member of the armed forces of the United States or of any friendly foreign nation who, after September 8, 1939, has distinguished himself by exceptionally meritorious conduct in performing outstanding services. The Legion of Merit, the first United States decoration created specifically for award to citizens of other nations, was established by an Act of Congress of July 20, 1942, amended by an executive order of March 15, 1955. It is conferred on officers and enlisted men of the Armed Forces of the United States and on nationals of other countries "who shall have distinguished themselves by exceptionally meritorious conduct in the performance of outstanding services" since September 8, 1939, the date of the President's proclamation of the state of emergency that led to World War II. 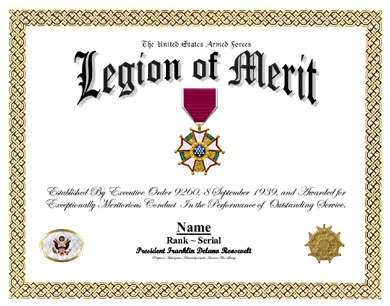 The Legion of Merit may be awarded for combat or noncombat services; in the case of American military personnel, if the award is for combat service it is shown by the wearing of a combat "V."
The Legion of Merit was originally ranked directly below the Distinguished Service Medal in the Navy's pyramid of honor." This was changed by Navy directive number 49 of January 28, 1946, which placed the Legion of Merit immediately below the Silver Star, thus making it the Navy's fifth ranking decoration. (1) Description: On a wreath of Green laurel joined at the bottom by a Gold bow-knot (rosette), a domed five-pointed White star bordered Crimson, points reversed with v-shaped extremities tipped with a Gold ball. In the center, a Blue disk encircled by Gold clouds, with 13 White stars arranged in the pattern that appears on the United States Coat of Arms. Between each point, within the wreath are crossed arrows pointing outwards. The overall width is 2 15/16 inches. The words "UNITED STATES OF AMERICA" are engraved in the center of the reverse. 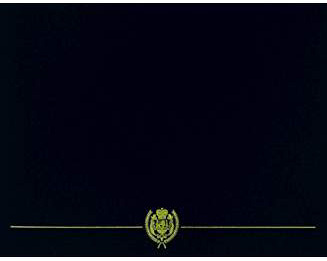 A miniature of the decoration in Gold on a horizontal Gold bar is worn on the service ribbon. (2) Components: Decoration breast badge, MIL-D-3943/12, NSN for complete decoration set is 8455-00-269-5752; NSN for individual decoration set is 8455-00-246-3821. The specification for the service ribbon is MIL-R-11589/80 and the NSN is 8455-00-252-9925. The lapel button is MIL-L-11484/10-1, NSN is 8455-00-253-0813. (1) Description: The design is the same as the degree of Officer, except the suspension ribbon does not have the medal replica. (2) Components: The decoration set for degree of Legionnaire and the Legion of Merit issued to U.S. personnel consists of the decoration, service ribbon and lapel button and is NSN 8455-00-262-3469. Individual components are the regular size decoration, MIL-D-3943/13, NSN 8455-00-246-3832; the service ribbon, MIL-R-11589/80, NSN 8455-00-252-9932; and the lapel button, MIL-L-11484/10-4, NSN 8455-00-257-4306. The miniature decoration, MIL-D-3943/13, is not part of the set but is stocked separately, NSN 8455-00-996-5009. 2. Ribbon: The ribbon for the decorations is 1 3/8 inches wide and consists of the following stripes: 1/16 inch White 67101; center 1 1/4 inches Crimson 67112; and 1/16 inch White. (1) Chief Commander - Chief of State or Head of Government. (2) Commander - Equivalent of an U.S. military Chief of Staff or higher position but not to Chief of State. (3) Officer - General of Flag Officer below the equivalent of a U.S. military Chief of Staff; Colonel or equivalent rank for service in assignments equivalent to those normally held by a General or Flag Officer in U.S. military service; or Military Attaches. (4) Legionnaire - All recipients not included above. b. The Legion of Merit is awarded to all members of the Armed Forces of the United States without reference to degree for exceptionally meritorious conduct in the performance of outstanding services and achievements. The performance must have been such as to merit recognition of key individuals for service rendered in a clearly exceptional manner. Performance of duties normal to the grade, branch, specialty or assignment, and experience of an individual is not an adequate basis for this award. For service not related to actual war the term "key individual" applies to a narrower range of positions than in time of war and requires evidence of significant achievement. In peacetime, service should be in the nature of a special requirement or of an extremely difficult duty performed in an unprecedented and clearly exceptional manner. However, justification of the award may accrue by virtue of exceptionally meritorious service in a succession of important positions. 4. Background: a. Although recommendations for creation of a Meritorious Service Medal were initiated as early as September 1937, no formal action was taken toward approval. In a letter to the Quartermaster General (QMG) dated 24 December 1941, The Adjutant General formally requested action be initiated to create a Meritorious Service Medal and provide designs in the event the decoration was established. Proposed designs prepared by Bailey, Banks, and Biddle and the Office of the Quartermaster General were provided to Assistant Chief of Staff G1 (Colonel Heard) by the QMG on 5 January 1942. The Assistant Chief of Staff G1 (BG Hilldring) in a response to the QMG on 3 April 1942, indicated the Secretary of War approved the design recommended by the QMG and directed action be taken to assure the design of the Legion of Merit (change of name) be ready for issue immediately after legislation authorizing it was enacted into law. b. An Act of Congress (Public Law 671 - 77th Congress, Chapter 508, 2d Session) on 20 July 1942, established the Legion of Merit and provided that the medal "shall have suitable appurtenances and devices and not more than four degrees, and which the President, under such rules and regulations as he shall prescribe, may award to (a) personnel of the Armed Forces of the United States and of the Government of the Commonwealth Philippines and (b) personnel of the armed forces of friendly foreign nations who, since the proclamation of an emergency by the President on 8 September 1939, shall have distinguished themselves by exceptionally meritorious conduct in the performance of outstanding services". The medal was announced in War Department Bulletin No. 40 dated 5 August 1942. Executive Order 9260, dated 29 October 1942, by President Roosevelt, established the rules for the Legion of Merit and required the President's approval for award. However, in 1943, at the request of General George C. Marshall, approval authority for U.S. personnel was delegated to the War Department. Executive Order 10600, dated 15 March 1955, by President Eisenhower, revised approval authority. Current provisions are contained in Title 10, United States Code 1121.
c. The reverse of the medal has the motto taken from the Great Seal of the United States "ANNUIT COEPTIS" (He [God] Has Favored Our Undertakings) and the date "MDCCLXXXII" (1782) which is the date of America's first decoration, the Badge of Military Merit, now known as the Purple Heart. The ribbon design also follows the pattern of the Purple Heart ribbon. (1) Chief Commander - China's Generalissimo Chiang Kaishek was a first recipient. (2) Commander - Brazil's Brigadier General Amaro Soares Bittencourt was first to receive this or any of the degrees. (3) Officer - first to receive the Officer degree were Colonel Johanes K. Meijer of the Royal Netherlands Army, Major Herbert J. Thompson of the British Army, and Major Stephan M. Dobrowalski of the Polish Army. (4) Legionnaire/Legion of Merit - First award to Lieutenant Anna A. Bernatitus, heroic Navy Nurse who served at Bataan and Corregidor. (5) At the beginning of the North African Campaign, General Lyman L. Lemnitzer accompanied General Mark Clark by submarine to North Africa. Upon arrival, about 60 officers were awarded the Legion of Merit and were among the first awarded the medal. By some misunderstanding as to the rules governing the awards, these 60 American Officers were awarded the degree of Officer. According to General Lemnitzer, President Roosevelt was annoyed, however, he did not rescind the awards. Accordingly, these were the only American Officers awarded the Legion of Merit with a degree. Source: The provisions of Executive Order 9260 of Oct. 29, 1942, appear at 7 FR 8819, 3 CFR, 1943-1948 Comp., p. 1222, unless otherwise noted. 1. The decoration of the Legion of Merit shall be awarded by the President of the United States or at his direction to members of the armed forces of the United States and members of the armed forces of friendly foreign nations, who, after the proclamation of an emergency by the President on September 8, 1939, shall have distinguished themselves by exceptionally meritorious conduct in the performance of outstanding services. 2. Awards of the decoration of the Legion of Merit may be proposed to the President by the Secretary of the Army, the Secretary of the Navy, and the Secretary of the Air Force, each acting upon the recommendation of an officer of the armed forces of the United States who has personal knowledge of the services of the person recommended. 3 (a). The decoration of the Legion of Merit, in the degrees of Commander, Officer, and Legionnaire, shall be awarded by the Secretary of Defense or his designee, after concurrence by the Secretary of State, to members of the armed forces of friendly foreign nations. (b). Recommendations for awards of the Legion of Merit, in the degree of Chief Commander, to members of the armed forces of friendly foreign nations shall be submitted by the Secretary of Defense, after concurrence by the Secretary of State, to the President for his approval.